The Apple’s success hides in the Company’s simplicity. It was driven efficiently by the vision of Steve Jobs. Generally, Jobs reject the work not only because it was bad but because if failed to distill the idea to its essence. The simple stick denotes the core value of Apple. Clarity forces an organization. The clarity must be pervasive but not occasional. Apple, the name itself indicates regard and admiration. Steve Jobs with his brain child Apple Inc. revolutionized the world listened to music and operated the traditional computers. The untimely death of Jobs left a permanent hole in the heart of every computer. The first Apple computer was released under the name of the Apple computer company. The first personal computer used TV as the display medium. None other computers offered any sort of display. The Apple computer worked much faster than other machines and provides easy startup RAM and bootstrap code. The next step of Apple was the introduction of a new and advanced version Apple II. This was really popular in that time. Macintosh is the most famous product of Apple. It was the first computer to make use of the graphical mouse interface. In the beginning stages, Jobs had the inability to handle the firm on his own. He lacked the maturity of the strategist. Sculley was the best choice brought about stability and efficient management. The development of iMac led to the success and escalated the growth of the company. iMac was the combination of CRT display and CPU design. As the company shifted its focus to conserving the aesthetics of the products, the company gained noteworthy success and online news popularity. Apple went on to introducing other shaking products like inventing new operating system MAC OS X, Mac G4, etc. 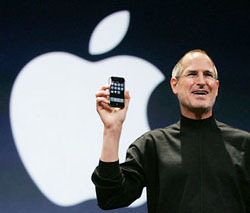 The major setback to Apple was the loss of its founder, the genius Mr. Steve Jobs. Even after that, the company is striving hard with its new CEO in launching products with same style, charisma and power of previous products. A long term perspective of the company can be known only when the future releases of iPhone, iPad and iPod are launched and the way they impact the people. The company and its new CEO have a bigger job in hand in sustaining the popularity of the brand in the electronics market. As of now, Apple products are still the number one choice of the people.